I moved around a few times when I was a kid but always in the South. I was born in Virginia and lived in Florida and Georgia briefly growing up. But most of my childhood was spent in North Carolina. I lived in Durham, North Carolina from fifth grade up to the summer before my junior year of high school. Then we made one last move to Lexington, South Carolina. My family still lives around there. I double majored in English and religious studies at the College of Charleston. As a religious studies major, I was really interested in the theoretical side of religious studies. Likewise, I was drawn to literary theory in my English major but also to the literature of the American nineteenth century. Looking back, I can trace a lot of my current interests to that combo of nineteenth century American literature and critical theory in both fields. I signed up for an intro course titled “Approaches to religion” my first semester, which I really enjoyed. Later my freshman year my new girlfriend at the time, now my wife, said she loved her religion professor and that we should both sign up to take his Buddhism class in the spring semester. We both loved that class and so it just kind of picked up steam from there. I had my best job ever the summer between graduating college and starting grad school. I was a pedi-cab driver in downtown Charleston. I’d drive tourists all around the city all day. Then drive drunk tourists all around the city all night. And I made a ton of cash. I’d get off work after the bars closed at 2 a.m. and go to Waffle House with friends and treat everyone to hash browns. American religion is an interesting subfield because we’re all insiders. We’re all Americans studying America and arguing about who “we” are. I think I’ve always liked the urgency and relevancy that comes from that oddity in the field. Whether or not it’s true, Americanists always feel like we are really important and have something really important to say to other Americans about America. I have a couple other hats that I wear right now. I’m the managing editor of an online magazine, Sacred Matters. I’m also co-chair of the North American Hinduism group of our scholarly society, the American Academy of Religion. My job there is to help strengthen the small subfield of Hinduism in America. Currently I’m revising a book manuscript, From Heathens to Hindus: Religious Difference in Protestant America. It’s a history of how Americans represented Hindus in the nineteenth century, before there were actual Hindus in America. I’ve also got a few small projects I’m working on. My favorite is a chapter I’m contributing to an edited volume about the films of the Coen brothers. I like getting away from my desk and outside. I try to get out hiking with my kids and my dogs as much as possible. I also love running and cycling. But for all that outdoor stuff, I still love prestige television that makes me feel like I’m hip. Take a look at this video, which features Prof. Altman among other faculty members, to learn a little more about his work. 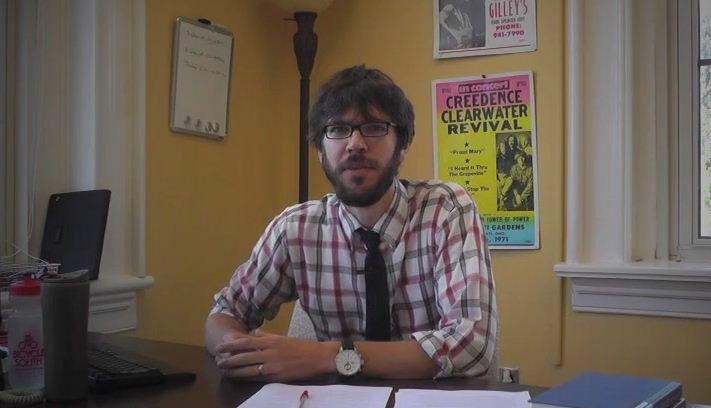 To learn a little more about Prof. Altman, take a look at his ar·ti·facts video. This entry was posted in Faculty Blog, Relevance of Humanities, Religion in Culture and tagged American Academy of Religion, American religion, Backstory, College of Charleston, Hash browns, Hinduism in America, Michael Altman, Sacred Matters, Waffle House by Andie Alexander. Bookmark the permalink.